Sketchtravel - The original book will be auctioned to benefit an international charity. The Sketchtravel is a unique international charity art project. This red sketchbook was passed from one artist's hand to another like an Olympic torch in an artistic relay through 12 countries over 4 and half years. The original Sketchbook with 70 pieces of artwork in its hand carved wood case will be auctioned. All proceeds will be donated to Room to Read. Given the contributing artist's backgrounds in illustration, animation, and comic books, a charity focused on child literacy was a fitting choice. The non-profit, Room to Read, focuses on literacy and gender equality in education for children in developing countries. Sketchtravel is supporting Room to Read's South East Asia programs: The charity collaborates with local communities and governments to establish libraries, encourage development of local language, culturally-relevant children's books, and foster literacy in other ways. Donate directly to our cause! 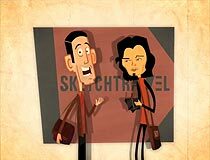 Any Question about the publication of Sketchtravel? You will be the first to know about upcoming news about U.S. and Japanese publishing! Born in 1974 in Nantes, France, Gerald is an illustrator and background designer for cartoons. In 1998, he graduated from the Ecole Nationale Superieure des Métiers D'art (Olivier de Serres) with a degree in Visual Communication. His current clients include Vivendi Universal Publishing; Excelsior; Bayard Presse; Prisma Presse; Futurikon; Alphanim studio; Xilam studio; and Marathon Media. The U.S. Agency Shannon and Associates represent Gerald. He also began the collective comic Rendez-vous in September 2008, published by Akileos. Originally from Japan, Dice went into the world of animation through successful roles at Lucas Learning Ltd. and Blue Sky Studios, creators of Robots, Ice Age, and Horton Hears a Who! In 2007, Dice joined Pixar Animation Studios as an art director on the Academy Award winning film Toy Story 3. Dice regularly exhibits his original paintings in various galleries around the world. In addition, he published a children's book, I Can Hear in Japan. Dice strongly believes in bringing the artistic community together for various charitable causes. He has led successful charity initiatives such as the Totoro Forest Project environmental project and Artists Help Japan, the latter of which raised funds for Japan earthquake disaster relief.